We talked to Mr Tenant on the phone. He was at home in London.Tennant was very merry while he was answering our question. Question : You were working for Samash Hits magazine.What kind of music were you interested in? was very good because Dance music was appearing, Hip-Hop was borning in New York, Breakdance madness was spreading. I wrote album criticism articles too. Question : were you an merciless critic? Answer : Sometimes, I was very merciless (Laugh), I wasn`t speaking ill of, I was prefering making fun. Answer :Yes,Smash Hits Sent me To new York to interview with The Police. New York ,we recorded our first Single West End Girls. Question : Is it true that, You and Chris have different pleasures about music? Answer: We have many common thing that we like, and also many opposite things.Chris is more curious dance music than me. But I listen to music more than him.He always watches Tv,ha ha ha! Question :You are together 20 years.How do you success this? are very different lifestyle,but as we are pet shop boys we always have a good time. Question: Have you ever bored each other? Have you ver fighted(argue? Question : How do you describe your and Chris` character? being funny and making fun. Sometimes You cant believe ha ha ha! in fact Everything is a comedy. a good position in music world, People have always analysed us Out of music’ WHY? we are not only a dance music group or a pop music group. (Our style is not only a dance music or a pop group). In our most succesful period, People said ‘You are a very strange group’ Because we were not a typical group. Rock festival listeners (watchers) know our all songs. They sing our songs all together.It is very strange. to our music..We have mixed them.But nowadays, Look at pop music, It is very ordinary and monotonous. 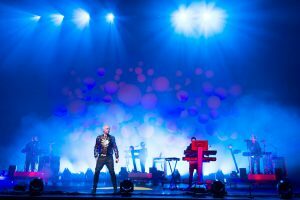 Answer :I have alway seen pet shop boys as a mark.We are famous but not with our faces, WITH our names,music and style. Question : If Psb is a famous mark, what are the peculiarities of PSB? melodies, and our theatral show on the stage. world everything is possible.Because of that, you say many things that many people could not say. rap world will be very interesting.Oasis and Mandeslon were little referances. Question : What were their reaction ? they understand joking (mocking). We havent seen any problems with them.No problem! And also, You started a new fashion wearing CCCP t-shirts.What is the relation between you and Russia? Answer : We are not Politic.But In ‘Go West’ song , an another thing happened.People saw that song as a politic songs. Soviet direction,changings there, impressed me.We did not write (cover) ‘Go West’ for Russians.The song was Chris` idea. We started making clip,in that time we were invited the openning MTV-Russia.And we decided making the clip there..
started listening to us with Go West. Question : You have made electro-pop songs for 20 years.But In 2001, in ‘release’ we listen Rock-style songs. What was the reason of this change? different things. Even, We thought making an hip-hop album. Question : You are a good song writer!! and George Michael.But, Madonna is a very good musician. People see famous people who make show, have a good image,making good performance, as a puppet. For years we sing the songs that we have written. beauty,spark) . It should be different and people show reaction to the song.EMINEM is very succesfull about it. Question : Do you have any singer(s) that you like? Answer: I liked justin Timberlake`s new single.his style is like Michael Jackson`s.Kraftwerk`s last album is very good. Answer :I dont think, there is an age limit.We have fans who are 20 or 50 .Describing our fans is difficult. I cant put our listeners to any category because We are not in any category. i think it impressed you.How will happen your Istanbul concert? You will see many shows. AND YOU WILL LISTEN TO NEW VERISONS OF OUR SONGS. YOU WILL BE THE FIRST. i have no doubt pet shop boys will sparkle in the festival.